There are lots and lots and lots of Children’s Book awards but without question, the most prestigious award that recognizes quality children’s literature is the Newbery. Right now, we are almost exactly one week away from finding out which books from 2016 will earn medals this year. So today we are diving into the who, what, where, when, and how of the Newbery Awards. And I’ll also chat about some of the controversies and include some great resources where you can find out more. The Newbery is an annual award given by the Association for Library Service to Children – abbreviated ALSC – so if you see those four letters, that’s what they mean. The ALSC is a part of the American Library Association – the ALA. A little interesting side note – the Association for Library Service to Children has changed it’s name a couple times and so the Newbery medal itself still says “Children’s Librarians’ Section.” which doesn’t actually exist anymore. The award is almost a hundred years old – it was established in 1922 and named after John Newbery, an 18th century British publisher and bookseller who was well known as one of the first publishers of children’s books. And – the Newbery was the first children’s book award in the world. So the award goes to a children’s book that is distinguished, noted for significant achievement, marked by excellence, and contributing something special to American literature. It has to be an original work, in English, and the author has to be a citizen or resident of the U.S. The focus is really on the text of the work and not any illustrations and it could be any genre. And notice that it doesn’t say that it has to be a novel or even fiction. Last Stop on Market Street, last year’s Newbery winner was a picture book. And boy – were there some shocked folks last year! The ALA criteria only states that it has to be a book for children, which is defined as up to and including age 14. So that’s a wide range to consider. Every year there is one Newbery winner and usually between about two and four Newbery honor books. Although – they don’t have to award any honor books and some years they have not. So that will be something interesting to look for this year. Where & When is the Newbery awarded? The Newbery is awarded once a year in January during the American Library Association’s Midwinter Meeting. Don’t you just love how that sounds? “Tis a “widwinter meeting” – I’m imagining everyone wearing long luscious cloaks and carrying chalices filled with hot cocoa – and marshmallows. Sigh – it’s not really like that, is it? Alas – that’s how I’m picturing it in my head anyway. And if I ever have a chance to attend, I will wear a fancy cloak and bring some hot chocolate – with marshmallows. So – the ALA Midwinter Meeting & Exhibits (we can’t forget the exhibits) is in Atlanta this year. Last year was Boston, previously Chicago and Philadelphia so they change location every year. The conference lasts about five days and within that time, the members of the Newbery committee meet in seclusion for two very, very full days to discuss, and vote, and eventually decide … and call the winners in the early hours of the morning the day that they are announced. This year, the announcements are made on the morning of Monday, January 23rd from about 7:30-9 EST – along with several other fantastic awards, including the Caldecott. And you can see it live right through the ALA website – ala.org ! Definitely have it streaming in your classroom or library or at home! Who decides the Newbery Award? It’s a committee of 15 people and the members are public – posted right on the ALA website. But that’s about all that you’re gonna get to know! Well – you know the process and the people, but the details of the deliberation are all secret. So, let’s talk about those 15 people and then we’ll discuss their process. So how do you get to be on the Newbery Committee and be in the room where it happens? You have to be a member of the ALA and the Association for Library Service to Children. Then there is a ballot in the spring where the members of the association elect 8 members to be on the Newbery committee. Then the ALSC president appoints the chair and six more members to make a total of 15. If that interests you, join the ALA and the ALSC and start getting involved and see where that takes you. But – I have to say, from all that I’ve read and seen – it is an incredible amount of work. You are committing to reading as much as possible of what’s published in one year. And doing some incredibly deep analysis of those titles. How are the books determined? Well, we’ve talked about the Who – let’s move on to the How. How in the world do these 15 committee members decide on the “most distinguished” book for children? How is the winner picked? And how do they decide on the honor books? Essentially there are three stages: 1. Nominating, 2. Discussing, and 3. Balloting. First up, Nominating: There are three rounds of nominations, one in October, one in November, and one in December. After many months of reading and rereading and taking notes with the Newbery manual at their side, it’s now October and members nominate three titles and include a write-up of why they think it’s worthy of the award. In November, they nominate two more with the same process, and then two more in December – making it 7 total nominations per person. So that allows for the committee members to spend October – December reading and reexamine books nominated by others so they are ready for the January debate and voting process. The next step is Discussion. This happens right at the ALA Midwinter Meeting in January where the 15 members are secluded over two days and discuss the merits of every book nominated. Then likely, they’ll move on to the potential negatives of each book under consideration and then the comparisons start. There are guidelines to the discussion (and I’ll link to those in the show notes), but essentially they debate and analyze and constantly refer back to the criteria of the award until they’re ready to start narrowing things down. Each member of the committee writes down their 1st, 2nd, and 3rd choices on a ballot. 1st place vote is worth 4 points, 2nd place vote is 3 points, and a 3rd place is 2 points. The winning title must have a majority of members (at least 8) place it as #1 and have an 8 point lead over all the other books. If that doesn’t happen, the committee has to have another discussion, and they may decide to take some titles that got low points off the table. And then they’ll vote again (and maybe again) until they arrive at a winner. After that, the Newbery committee decides if they want to choose any honor books from the nominations either selecting from the final ballots or redoing the whole process again. Ah – what I wouldn’t give to be a fly on that wall! BUT – the Newbery award is not without its critics and controversies. Some claim that a lot of the picks are unreadable and unappealing to most kids. And there’s been a recent debate over the secrecy of the deliberations. Right now, members are not allowed to reveal anything about that process ever – which books were initially nominated, why they were rejected, or how contentious the voting might have been. Former Newbery and Caldecott committee members, Kathleen Horning and Ed Spicer, both wrote articles about the benefits of time-limits on the confidentiality of the selection process. They make excellent points about the benefits to readers, authors, and to history. On the other hand, Caldecott winner Dan Santat argues that releasing that information is not really a good idea. No one knows how the Academy Awards or Grammys get picked so really, what’s the big deal? I’ll link to those articles in the show notes – they’re worth reading and might offer a good debate topic to your students, and I think the ALA is considering a change to that policy. So that’s something to keep an eye out for. And – if you want to know more about the how the Newbery Award works, there are a lot of great resources I’ll share on the website. A special shout out to Heavy Metal – the Mock Newbery Blog run by two former committee members. Excellent resource – definitely check it out! So – I want to know what you all think! Do you think the Newbery award books are unappealing to kids? Do they read them? Do you think the Newbery selection process is TOO secretive? Let me know what you think! You can send me an email at booksbetween@gmail.com or tag me on Twitter or Instagram with the handle @Books_Between. In this part of the show, I share with you a couple books centered around a theme and discuss three things to love about each book. This week we have two adventure stories that will get your pulse going! They are each very different – one is a more of a traditional action/adventure survival story and the other is a fairy tale fantasy adventure. But – despite their differences, they do have a surprising amount in common, which is why I thought they would make a good pairing today. Both include characters hidden away in towers, folded paper birds, and secret libraries. Have you guessed yet? They are: Scar Island by Dan Gemeinhart and The Girl Who Drank the Moon by Kelly Barnhill! Colin. He is this little pip of a kid who has a lisp and is an admitted kleptomaniac. That’s why he’s at Slabhenge Reformatory. But, when he steals some food, he gives it to Jonathan even though Colin is hungry himself. He’s also into origami and makes these little paper cranes that appear at important parts later on in the story. I just loved him. But – one little note about his lisp. I was conferencing with a student a couple days ago who was reading this book and he had a tiny bit of trouble reading aloud and interpreting Colin’s dialogue, so I had to talk about how the “th” is replacing his “s” and model a bit what that sounded like. So just a heads up about that. The Library. This is verging on giving away too much, but I’ll say that during one of the character’s journeys through the labyrinth of corridors in this stone fortress, we discover a library and there’s a character who surprises us and knows the exact right book to recommend. The buildup of suspense. There are these five threads that run through this story creating this tension as you read it. One – the weather. What starts off as a bad storm becomes this hurricane that threatens everything on the island. Two – the rats. Eventually you discover that there’s more going on with the rats than meets the eye. Three – the key. At a critical point, one of the characters ends up with the key to the Admiral’s office which contains lots of chocolate, alcohol, and… all the boys records. So throughout the story we are wondering – who has the key now? And – what are they going to do with it? Four – the forbidden door hiding this monstrous, noisy… thing. Five – the suspense of figuring out why on earth Jonathan is on this island. What did he do?? We know he feels like he deserves to be there. And we get glimpses of his previous life in his letters home and we have scenes where the author almost reveals what happened, but then pulls back. So – the weather, the rats, the key, the door, what did he do? – argh! – this book has you turning those pages! 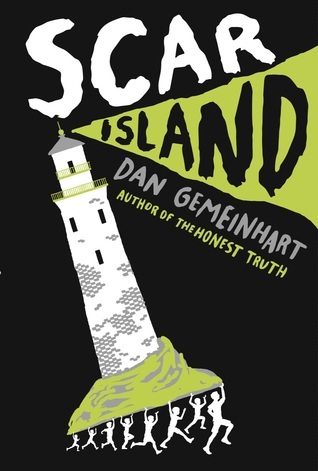 Scar Island is kind of like Lord of the Flies meets Holes with a twist of pirate in there. Already I have a waiting list for it in my class and I’m sure it’s going to be a favorite with your kids, too. The magic. This is not your typical sparkly, wand summoned magic. It’s earthy and primal and often exists as something almost separate from the characters. Flowers spring from footsteps. And there is a flock of paper birds that swarm and cut and lead and protect in a way that is both beautiful and terrifying at the same time. I loved how unique the magic in this book was. The love you feel for the characters. Somehow Barnhill has written them in a way where you feel this deep sense of warmth and protectiveness and empathy for them. Xan, the witch, is getting older and she desperately wants to impart all of her knowledge that she can to her granddaughter, who she’s named Luna. But that same spell that protects her makes it so that she can’t get through to her. And you keep hoping that Luna will discover who she is and maybe be reunited with the mother she was so brutally ripped away from. And all the people in the village – especially Antain and his wife – who are under the thumb of the Council of Elders. I just felt so much love for this characters. What this story has to say about truth and power. In this book, there are some who feed off of other people’s misery. Those who raise themselves by putting others below them, by controlling what stories get told, and by spinning lies. But – there comes a time when the people start to realize how much power they actually have when they band together to use it. Loved it. The Girl Who Drank the Moon is lush and quirky and whimsical and funny and full of adventure. And I can’t wait to read everything else Kelly Barnhill has ever written because this was one powerhouse of a book. Our final segment this week is Question & Answer time. I’m a little reluctant to answer because inevitably, I am going to be wrong. But … I can tell you who others think are some top 2016 contenders, and I’ll venture to make a prediction or two. So, one place I go to get a feel for some of the books getting Newbery buzz is the Mock Newbery Group on Goodreads. They read a book a month and then vote in January. What’s cool there is that you can see the discussions going all the way back to 2012 and take a peek at the reactions to the real winners. That’s enlightening. This year their second round list includes, in order,: Wolf Hollow, Ghost, The Inquisitor’s Tale, The Wild Robot, The Girl Who Drank the Moon, Some Kind of Courage, and Pax. Over at the Heavy Medal Blog, they have analyzed “Best of” lists on other sites to put together a “Best Books” post naming and ranking the contenders with the most mentions. So, some of the top books there that I haven’t mentioned already are: Some Writer: The Story of E.B. White, The Best Man, March Book 3, Ms. Bixby’s Last Day, Raymie Nightingale, Samurai Rising, The Lie Tree, and School’s First Day of School. I think there will be a lot of honor books this year. I’m saying at least 4. I don’t think they are going to give the award to a picture book this year. Not that I disagreed with the decision last year, but I have a feeling it will go to a book with an older audience. I think you’ll see a shiny seal on at least a couple of these books: Wolf Hollow, The Girl Who Drank the Moon, The Wild Robot, Pax, and… I almost don’t want to admit this to you because it sounds silly, but I dreamt I was watching the live streaming of the awards and the winner was – The Inquisitor’s Tale! So maybe something’s going on in my subconscious… Or not! We’ll see in a few days! Alright, that’s it for the Q&A section this week. If you have a question about how to connect kids between 8-12 to books they’ll love or an idea about a topic we should cover, I really would love to hear from you. You can email me at booksbetween@gmail.com or message me on Twitter/Instagram at the handle @Books_Between. You can get a full transcript of this show and all of our previous episodes at AlltheWonders.com. And, if you have a moment, it would mean so much to me if you left a rating or review on iTunes or Stitcher so others can find us. Thank you and see you in two weeks! Bye! Pingback: A Review: “Books Between Podcast” – WORD.